From Palestine to Standing Rock We Are United. Juntos Protejamos. Mni Wiconi. Artwork and signs of solidarity from all over the world decorated the fence and the main entrance, where volunteer security guards welcomed a line of cars that grew increasingly longer each day. At nightfall, Sioux elders invited anyone who wanted to join in prayer around a sacred fire. But the Suburbans, stadium lights, and police could still be seen in the distance, tiny figures on a hill called Turtle Island, which the Standing Rock Sioux say is a sacred site where people are buried. Directly outside the camp, four Humvee vehicles and one large military troop carrier, like something you would see on the nightly news from the wars in Iraq or Afghanistan, were parked at a barricade on the highway road to the north, cutting people off from the only direct route to the state capital. In the southern direction, the rural road stretched for eight miles before the nearest convenience store and hotel, frozen over after a recent blizzard. 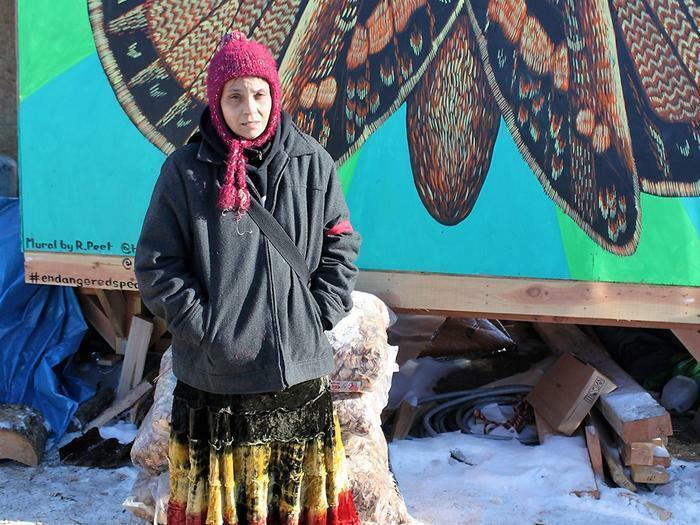 Even as a makeshift city rapidly grew on this swatch of federal land next to the Standing Rock Sioux Reservation and garnered worldwide support and donations, people were isolated. Nobody who chose to camp in this desolate, freezing tent city in North Dakota had anything but each other. Shortly before a blizzard hit western North Dakota in early December, North Dakota Governor Jack Dalrymple announced that no state emergency services would be sent to the encampments on federal land where thousands of people vowed to stay through winter. Piling on threats that everyone here was trespassing, the Morton County Sheriff’s Department said they would fine anyone who attempted to bring in supplies. For the people at Oceti Sakowin, the most populous of the three camps that the Standing Rock Sioux had organized to fight construction of the Dakota Access Pipeline under Lake Oahe, their source of drinking water, that only meant there was more work to do at the camp. People weren’t leaving, and many "weekend warriors" were only more inspired to come. At Oceti Sakowin, volunteers unloaded U-Haul moving trucks full of 2x4 studs for framing the structures that they'll use to get through the harsh North Dakota winter. People at the donation camps sorted through blankets and canned food, while others split massive amounts of firewood brought in by logging trucks, keeping the sound of chainsaws running throughout the day. 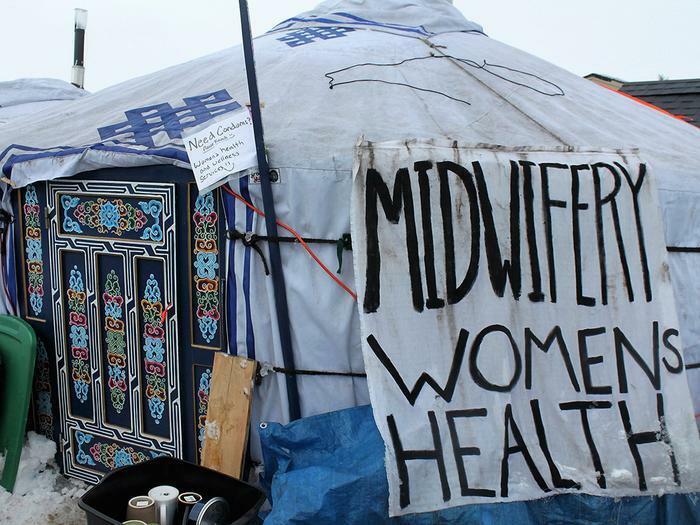 Medics worked all night at an emergency tent lined with linoleum floors, part of an encampment that also offered midwife services, mental health, an herbalist, and cots for people who were injured or in need of massages. Women from Wisconsin assessed people’s temporary shelter for construction crews and housed anyone who was unprepared for the weather in communal tents or the public food kitchens, which doubled as free-for-all sleeping areas at night. Young people dug snow and used firewood to build barriers around the many Tipi tents at the camp so that the elderly people inside would not have piles of snow at their feet when they stepped outside. Helicopters swarmed low above the land as an Indigenous activist group taught new visitors how to peacefully protest. Several drone photographers said they captured photographs of what appeared to be snipers in the hills. Federal informants were likely embedded in the camp and recording anything being said, attorneys who camped at Oceti Sakowin's legal tent warned. A street medic taught people how to remove tear gas from someone’s eyes should they get gassed, and an army veteran shooting photographs at the barricade out on the main highway road insisted that anyone still here on Sunday would be shot with rubber bullets. Eviction day, or the day when the United States Army Corps of Engineers said everyone had to leave, was coming the following Monday. "Whatever happens, happens. We’ll see,” said a 26-year-old man from the Pueblo nation in Arizona, standing outside of a warm makeshift house in Oceti Sakowin complete with a solar panel and shingles on the roof. Late Sunday afternoon, with eviction day looming, clergy from over a dozen faiths shared a stage with Chief Arvol Looking Horse, the spiritual leader of the Sioux tribe, and took turns leading people in prayer. A Catholic priest apologized for all the pain his religion had caused. A Muslim imam recalled how oil prices were the driving force behind the CIA’s decision to overthrow the Iranian government in 1953. Thousands of military veterans wandered the camp and listened. After the prayers, Sioux leaders asked the estimated 10,000 to 16,000 people there to join hands around the entire perimeter of Oceti Sakowin, a difficult task given the camp’s size. As the army vets, clergy, hippies, American Indians, medics, cooks, and others slowly formed a massive hand-holding circle, the tension that had been building up that weekend broke into an unexpected celebration. Energy Transfer Partners’ application to build underneath Lake Oahe had been denied, word quickly spread. The United States Army Corps of Engineers said the company would need to explore another route for the crude oil pipeline, one that didn’t impact the Standing Rock Sioux’s water. Many people broke down in tears and hugged. What happens next is unclear, and many water protectors say they will not leave. But the announcement symbolized a hopeful victory at an environmental standoff that American Indians say has grown bigger than any other they have seen in their lifetime. All rooms are booked at the reservation casino and hotel eight miles south of the Oceti Sakowin. Christmas songs blare on the loudspeakers in the parking lot, and the stench of cigarettes grows stronger the closer to you get to the hotel lobby. Due to excessive loitering, says a sign taped to the front door, anyone who isn’t a registered guest may be kicked out. But young people in dreadlocks huddle by the casino bar anyway, taking a break from the harsh weather. Curtis Muhammad, a longtime civil rights activist from the Student Nonviolent Coordinating Committee, is in the lobby, waiting to make a presentation for the Sioux. Joined by the Asian American Alliance, Muhammad says he wants American Indians to make refuge space available for minorities, the way they did years ago when blacks escaping slavery from the Underground Railroad needed a place to hide. “We expect that Trump is going to make a lot of us criminals just for being black, and we’re going to need a place to go,” he says. Levi Medicine Horn, a cultural preservation specialist from South Dakota whose job is to survey sites for the Sioux nation, is thrilled to see all of the outsiders who have descended on the reservation. American Indians have been fighting oil pipelines for years, he says. Foreshadowing the Dakota Access Pipeline protests, the Rosebud Sioux Tribe in South Dakota set up a “spirit camp” along the path of the Keystone XL Pipeline several years ago. The camp is still there, he says. Keystone XL united Native Americans and farmers against the project, leading to the creation of an environmental group called the Cowboy and Indian Alliance. But even that unifying campaign hasn’t attracted the international following that the #NODAPL fight has. Horn leases part of his own land to farmers, and he says he recently lost a client who was angry to learn that he had occasionally joined the protests against the Dakota Access Pipeline when his work brought him to North Dakota. The farmer criticized him for depending on fuel to power his truck while fighting an oil pipeline. He argues back to such criticisms: Between fuel or clean water for your children, you choose fuel? The Standing Rock Sioux leaders and tribal elders say they tried to stop the Dakota Access Pipeline from passing under Lake Oahe several years ago, but the #NODAPL movement in its current form began last spring, when Standing Rock Sioux tribal historian LaDonna Brave Bull Allard invited people to set up a prayer and resistance camp on the land she owned, a site now called the Sacred Stone Camp. 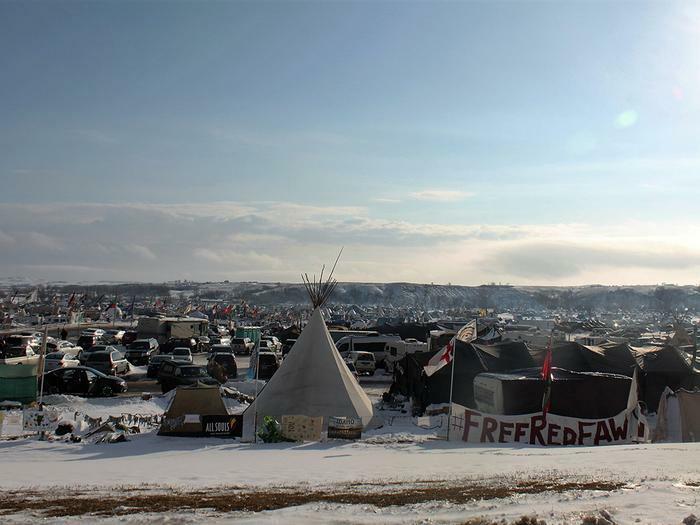 The Oceti Sakowin camp, on land below Sacred Stone, is the easier of the two to access by car and is the location that has drawn thousands more to the cause, by some estimates as many as 16,000 people on a given weekend. 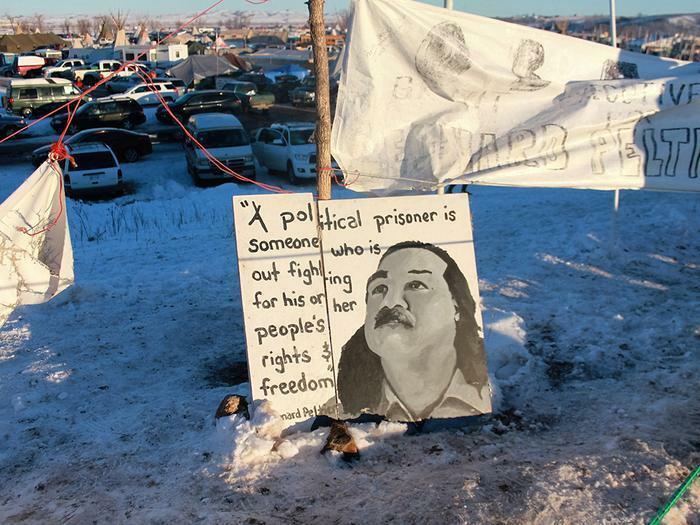 Opposite the river of Oceti Sakowin is the Rose Bud camp, a smaller tent city where the United States Army Corps of Engineers has deemed people are allowed to protest in a “Free Speech” zone. When there are no prayers, the sacred area becomes a spot where day-to-day needs are taken care of. Whoever drives the black Ford Fusion needs to move their vehicle; a woman needs a ride to Bismarck to catch a bus at 3 in the morning; we have found a pair of lost keys; and if you have been arrested please meet with the attorneys at the central dome today; are just some of the nonstop announcements made on the microphone in between sermons and prayers. The line for coffee around the prayer circle is slow, but people are in good spirits while they wait. One man in line says he was not planning to drive to North Dakota until he saw a woman crying outside of the grocery store in Montana where he works. She wanted to come to Oceti Sakowin but needed a ride. He will probably lose his job whenever he makes it back, he cheerfully says. A Unitarian minister from Wyoming, also waiting for coffee, says she is not afraid to get arrested for civil disobedience, considering such an arrest the mark of a true minister. Tibbetts is not exaggerating. She recounts how several years ago, a mining company expressed interest in Wisconsin’s Penokee Hills, land that environmentalists warned was home to a complex ecosystem and also culturally significant to the Lake Superior Chippewa Indians. To protest the mining operation, Tibbetts and others set up a tent city called the Penokee Hills Harvest Camp and stayed there for four years, surviving the bitter winter in wigwams and other weather-proof outdoor housing. Much like today, the protesters in 2014 were warned that they could not camp on public land. They ignored the government's demands to leave. Finally, iron ore company Gogebic Taconite abandoned its plans last year. “We inhabited the site,” Tibbetts says. While many people stay warm in Tipis, it takes up to eight weeks to fulfill an order for the appropriate liner for these traditional tents. And yurts, another tent structure that can survive brutal winters, cost as much as $3,000. To respond to the growing need for warm tent housing, a Seattle carpenter named Paul Cheyok'ten Wagner invented the Tarpee, a Tipi-like structure that only costs $650 and is kept warm via a wooden stove, designed with a steel plate at the top to radiate more heat. A slippery hill by the main entrance is "Media Hill," where journalists register to get laminated press passes and people can actually get a cellphone signal. Young children ride their sleds down Media Hill as their parents watch them from the top. Next to the warm media registration tent, a musician from Seattle rides a stationary bicycle, which is attached to a generator so that people can charge their cell phones by riding the bike. He came here with a group of friends but opted to stay when they left, he says through short breaths. Like many others at the camp, who are technically trespassing by staying here, he has asked not to be named. Not far from the sacred fire, Winona Kasto, a woman from the Cheyenne River Sioux Tribe in South Dakota, cooks two 50-gallon pots of soup every day, made from buffalo meat that she prefers to leave unseasoned. Her soup is popular because it is made with love, she says, and because the buffalo are pickier eaters than other mammals, eating flowers and other "medicine" from the ground. Her camp has doubled in size as people realized that Kasto needed a larger kitchen to accommodate all of the people who want to eat buffalo soup from Winona’s Kitchen, as a sign posted on her camp’s main Tipi calls the site. At a fire around Winona’s Kitchen on Saturday night, young doctors talk about the impressive medical care that they have witnessed here at Oceti Sakowin. "What they're trying to do here is community medicine really,” says Revery Barnes, a Cuba-trained doctor from San Francisco who now works at a hospital in South Los Angeles. She has come to drop off supplies and help people at the medic camp for a few days. Being a doctor at a hospital is like working in an assembly line, she says, but the unpaid doctors and medics at Oceti Sakowin give patients the kind of care she would like to see in the real world. “They’re trying to decolonize medicine. They’re trying to give patients options. This is what we think you have, and we have this herbalist to talk to, we have these herbalist services, we have a pill for you in Western medicine, but if you just want to sit here and talk, we can do that too,” she says. The visiting doctors ask for a picture with Kasto before they must return home in several days. “Winona is Lakota for gathers people woman,” Kasto tells the group, getting a big laugh from everyone. Even though many people say they are inspired about what the resistance camp has become and are happy to be here, concerns about the police and National Guard presence hang over the camp. Over Thanksgiving weekend, when thousands of people came for the holiday, a group of activists organized a "direct action" protest on the front lines to remove burned-out trucks that authorities had set up as a barricade. “Folks have a right to be on a public road,” Dallas Goldtooth, an organizer with the Indigenous Environmental Network, told reporters at the time. Officers responded by shooting the protesters with high-pressure water hoses. The Morton County Sheriff’s office also shot tear gas grenades, rubber bullets, and other weapons into the crowd, causing a 21-year-old woman named Sophia Wilansky to suffer devastating injuries to her arm. Vanessa Dundon, another water protector on the bridge, was shot in the eye with a tear gas canister and will likely be blind in that eye as a result, according to a page trying to raise money for her surgery. 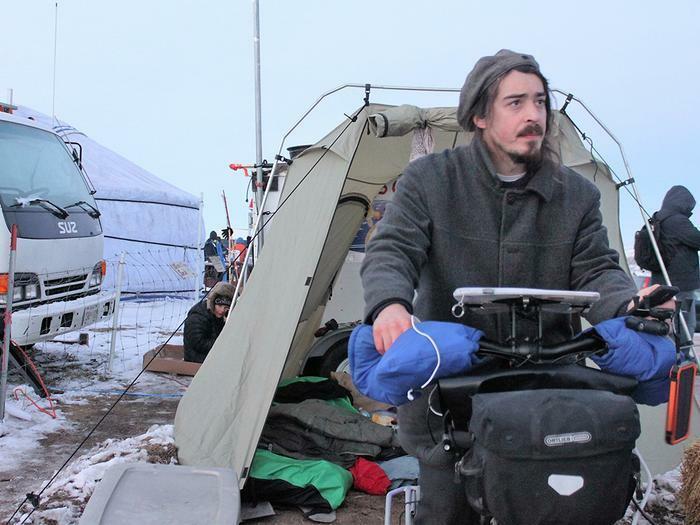 Concerns about police violence are what inspired thousands of veterans to descend on Oceti Sakowin last weekend, setting up military tents that will be left for people staying at the camp to sleep in once the vets leave. During their brief stay, thousands of the veterans were housed in a local community center to stay warm. The campgrounds are crowded on Sunday afternoon with veterans of all ages and clergy who answered a call for support from Chief Arvol Looking Horse, the Sioux spiritual leader. Wearing a traditional headdress with a black leather jacket and boots equipped with snow chains, Chief Looking Horse says he has asked people from all nations and religions to stand with the Sioux in solidarity. “It’s the responsibility of the people to say water is life,” he says. For the following three hours, clergy from the Unitarian, Catholic, Baptist, and Methodist churches, and Jewish and Muslim temples, give speeches and prayers. Leaders of tribes that used to be at war with the Sioux now speak about solidarity and protecting water for everyone. 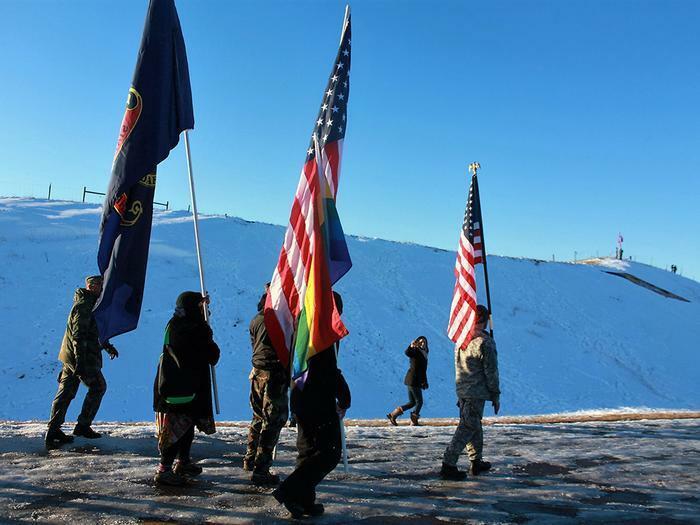 After the prayers, the Sioux elders say that they had originally planned to perform a direct action, or a civil disobedience protest, along the police barricade. But, they say, they have changed their minds. To keep the mood prayerful and peaceful, they instead tell everyone to join hands and make a circle around the entire camp. People are trying to close gaps in the large circle and are slowly making their way around Oceti Sakowin when news spreads that the Corps has rejected Energy Transfer Partners’ application for an easement under Lake Oahe. (Because Lake Oahe is a dam that the Corps created from the Misssouri River, the Corps requires companies to seeking to build under its project to get additional permits). The young veteran next to me breaks down crying as she hugs a friend. The Sioux leaders return to the stage where the solemn praying took place and now play celebratory music on the drums as reporters crowd around and shoot photographs. Many people pack up their cars, so they can leave before the next snowfall, and they honk and cheer at the new line of cars waiting to enter Oceti Sakowin. Military veterans lead a march along the road outside, where the barricade still stands but the Humvee vehicles have left. But even this celebration will be short-lived. Energy Transfer Partners and Sunoco Logistics Partners released a statement Sunday night suggesting that they planned to drill under Lake Oahe anyway, describing the Corps’ decision as purely political. Reaction to the news has been mixed. 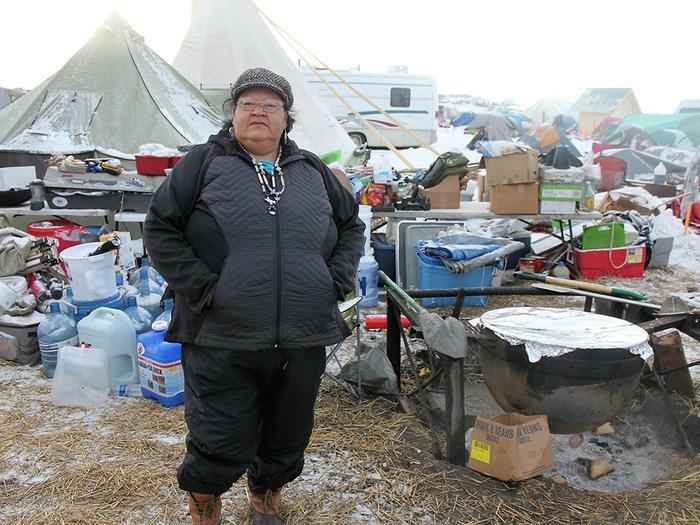 Standing Rock Sioux Chairman Dave Archambault II went on NPR to say that protesters achieved their goal “and it is time now for them to enjoy this winter with their families.” But other leading activists -- people like Sacred Stone Camp founder Dona Brave Bull Allard -- have vowed to stay. On Tuesday, as another blizzard hit the camp and temperatures dropped into the negatives, the local casino opened its doors to people so they could take indoor shelter, and Winona Kasto, the popular cook who fed everyone buffalo soup, posted online that she would be making food at the casino for people who could not afford the buffet. Not everyone can stay there forever, but she predicts that many people will continue to leave and return until the fight here is over. “All water is sacred. We have fights at home, so we’re going back and forth,” she says.